Gateway to Ko Phi Phi - Ko Lanta (Island), Krabi, Thailand. Ko Phi Phi is one of the top ten dream holiday destinations in the world, due to it’s tropical beach and the diversity of nature. 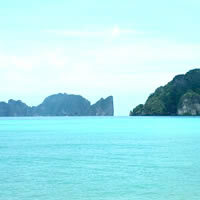 It is a part of Krabi province and just one hour by ferry boat from Ko Lanta. 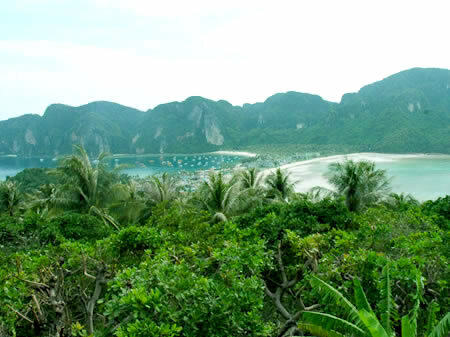 An archipelago of six islands comprised of Ko Phi Phi Don and Ko Phi Phi Ley - the major islands - Ko Phai and Ko Yung two of the smaller ones. The superb scenery here includes high hills with jutting cliffs surrounded by marvelous beaches and an emerald sea, hiding a bank of coral reefs and colorful marine life beneath it. The geography and sights that can be seen here are unique to the area. This is the largest island in the group with an abundance of fine beaches and many options for accommodation. 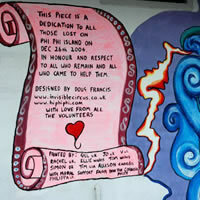 Phi Phi Don covers a total area of 28 square kilometres, 8 kilometres in length and 3.5 kilometres at its broadest point. 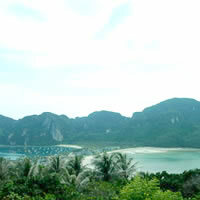 At the northern end is Laem Thong Cape, the location of a Chao Ley or Sea Gypsy, village. 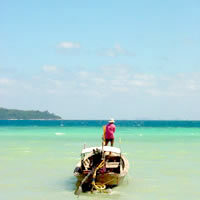 Snorkeling at the cape is excellent, as it is also at Hua Luk Ket to the extreme south. A 20 minute walk up the hill to the view point is good exercise, and a coffee shop can be found at the top for refreshments. To the right is shown the well-known photograph of the two horseshoe-shaped curving bays joining together. Ko Phi Phi Don is a centre for many visitors traveling around this area, with its wide variety of accommodation options and shops, restaurants, banks, dive schools and souvenir stalls which stand along the streets of the island trade complex. The island of Phi Phi Ley has a 6.6 square kilometres total area - 3 kilometres in length and 1 kilometre wide at its broadest point. The island is entirely limestone and the steep cliffs rising from the sea very nearly completely ring it. Surrounding waters average 20 metres in depth, dropping to 34 metres at the deepest point off the island's southern tip. The island has several beautiful bays - Pileh, Maya and Loh Samah amongst them. Ao Pileh is very nearly enclosed by the limestone walls of the island's cliffs, so that the water appears almost to be a small lagoon. On Phi Phi Ley's northeast side is the famous Viking Cave, renamed Tam Pya Nak by HM King Rama IX when he visited it in 1972. The name is taken from the shape of a particular boulder, which resembles the head of the great serpent of Buddhist legends, the Naga. It is a place much revered by the local people who come there to collect the swift's nests used to make Bird's Nest Soup, a Chinese delicacy. On the eastern and southern walls of the cave are coloured drawings dating from historic times. There are pictures of elephants and also of various boats: European, Arab and Chinese sailing ships; baroques, motorboats, and steamships. It is theorized that these were created by pirates who paused in their travels from west to east, sheltering in the cave to escape the monsoon winds, transfer cargo, or make repairs. There are no resorts or commercial businesses on the island – it's within the area of the National Marine Park boundary which protects the preservation of the lush natural habitat. It is just a few hundred metres from Phi Phi Don, and it's easy to find long tail boat taxi to take you exploring.